As sharks disappear from key locations, scientists are using environmental DNA to find a small number that may actually be hanging on. Years of visual surveys have left scientists worried that some species completely disappeared from areas where they were once abundant. 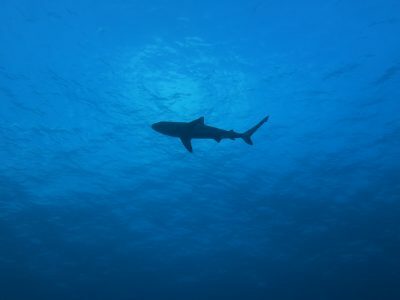 An international team of researchers has used a revolutionary technology to retrieve fragments of DNA from shark skin, excretions and blood in the water to determine that somewhere in the area, these missing sharks still reside. The team detected the presence of more shark species in just 22 samples of seawater filtered for DNA fragments than observed during 3,000 dives and 400 baited videos in New Caledonia, a French South Pacific territory. The results were consistent in remote areas along pristine coral reefs and near more impacted areas where sharks are scarce. The study reveals environmental DNA analysis has great potential to assist future conservation studies by improving species detection. Nearly half of all species of sharks, rays and chimeras are data-deficient in the International Union for Conservation of Nature’s Red List of Threatened Species, a comprehensive source of global conservation status of plants and animals. That means more information is needed from scientists to determine a protection status for these rare and elusive species. The researchers from France, the United Kingdom and Australia, as well as FIU, believe by acquiring just a small number of additional samples, they will be able to reveal which shark species are really missing in the region and which ones have a chance to rebuild their populations and thrive again. Their findings were published today in Science Advances.